Don't let leaks, drips and spills ruin your day! 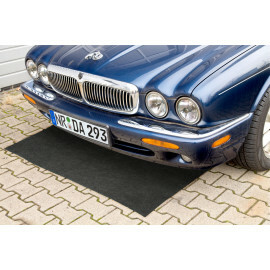 Our oil binding mat is a poly backed industrial rug that shields and protects garage floors and work surfaces by absorbing fluids without allowing them to penetrate the non-slip poly backing. Leaks, drips, spray and spills can cause damage and stain surfaces under all vehicles. Workbenches, shelves and walkways are also vulnerable to damage caused by spills and moisture. This mat protect surfaces and save hours of cleaning time. Absorbs up to 4 litres of liquid spills, drips and leaks. A highly absorbent top layer is backed by a thick layer of non-slip material that prevents liquids from seeping through to the floor. Easily cuts to any shape for use in smaller spaces.